That’s what my daughter was calling our afternoon snack. This is such and easy and tasty snack! 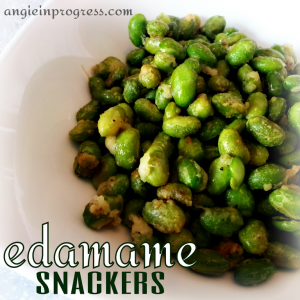 Do you like edamame? If you said no, than you need to try it like this! You won’t be able to stop popping them into your mouth! 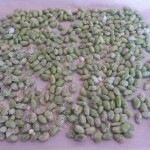 Edamame are immature, green soybeans still in the pod. You can get them fresh or frozen. 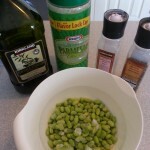 They can be boiled whole, then shelled and eaten as a snack or added to stir fries, soups or salads. Soy has many health benefits such as: weight loss, cardiovascular, and immune system. They are high in protein and low in fat! Which is a win-win combination if you ask me. BUT! Studies have shown a possible link to reproductive difficulties if eaten in excess, so don’t overdo it! Stick to one serving per day. Control yourself! OK? Preheat oven to 400°. Line a cookie sheet with parchment paper (this is a MUST!). 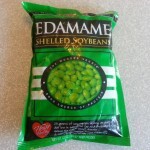 Toss frozen edamame with oil, cheese, salt and pepper (to taste). Pour evenly onto the lined cookie sheet. Bake for a total of 20-25 minutes, tossing every 5-10 minutes to cook evenly. Remove from the oven when they are turning a little golden brown, or to desired crispness! Let them cool and enjoy!